I just removed my vote for Excavator. The story behind it is that there was one parked on the campus a few days ago. Both Yukon and Excavator are leading, but I think we can all agree that Yukon is just better, so let’s go with that. 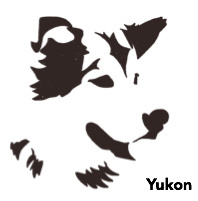 https://github.com/UAVCAN/Yukon is up. I’ll fork and start pull requests that include design documents. I see a dog. What’s my diagnosis? Random ideas galore. What if we turned the computational graph widget into an interactive graphical programming utility? Suppose we introduced a convention (recommendation) that all ports with non-fixed ID can be configured via a configuration parameter (register) named in a particular way, e.g., uavcan.subj.motor_angvel – this example shows us a configuration parameter which sets the subject ID of a data link that carries the angular velocity of a certain motor; the part uavcan.subj. 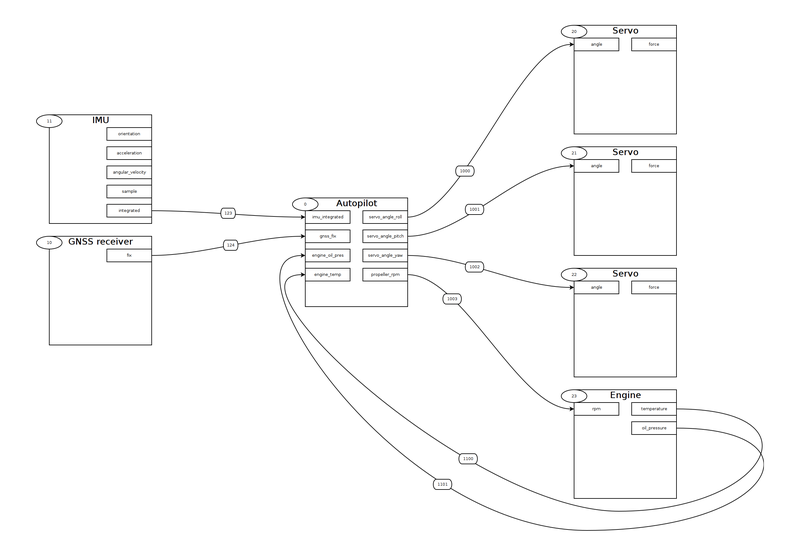 is dictated by the convention, and the suffix motor_angvel is defined by the user/vendor, it could be anything. The range of the parameter should be [0, 65536] (Natural32); the value 65536 is needed to represent an unconfigured subject ID. Boring. The user picks up their computer mouse, clicks on the connection point labeled servo_angle_roll, and draws the mouse over to the first servo’s connection point labeled angle. The user lets go of the computer mouse, thereby having created a new subject. But wait, this new subject does not have a fixed subject ID, yet we need one. The request to the autopilot assigns the value 12 to the register uavcan.subj.servo_angle_roll. The request to the servo assigns the value 12 to the register uavcan.subj.angle. Done, the link is now created (although it may not be active yet, depending on whether the nodes require a restart for the parameter change to take effect). 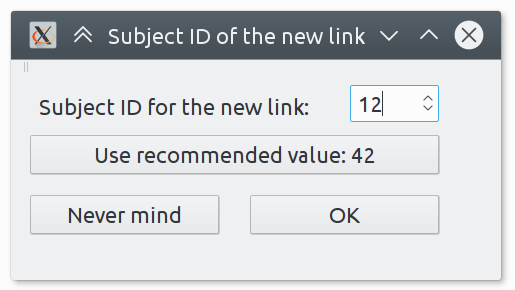 If the user wanted to add yet another connection point to the same subject, the dialog box exercise wouldn’t have be repeated, because Yukon will be able to deduce that we’re connecting a new item to an already existing subject with a known subject ID. The diagram is known to be incomplete and a bit misleading, because there always exist subjects with fixed port IDs that do not require a configuration. They are not shown in this demo. In the real widget they should probably appear as unchanging static links that can’t be disconnected or moved (they are static, after all). Should the user desire to get rid of an unwanted connection, they would just disconnect an appropriate link, and Yukon will issue a request uavcan.register.Access with the value set to 65536. It is assumed here that Yukon does not have any prior knowledge of the properties of the involved nodes; the information is deduced at runtime by evaluating the available registers; specifically, by matching all available register names against uavcan.subj.*. An overly attentive reader would point out that we never once asked ourselves: “is it type safe?” Indeed, such blatant disregard of type safety is borderline illegal. Type introspection data is dependent on the port ID settings. Type introspection can’t be performed until a port ID is assigned. Which in turn means that the correctness of a new subject link can’t be verified until the link is established. What can we do about this? Raising the level of abstraction of the existing introspection API doesn’t seem like a decent idea because all options that come to mind so far seem extremely complex and implementers may be hesitant to support them. Another solution is to go the way of other protocols and introduce the optional concept of electronic datasheets, where the type information will be explicitly stated. The third solution is to further extend the register naming conventions by adding a new name pattern: uavcan.type. *, where the asterisk stands for the port name – e.g., uavcan.type.servo_angle_roll – the value contained in the register will be the name of the data type together with the major version number, like uavcan.si.angle.Scalar.1. Ultimately we may want to go both ways: introduce electronic datasheets at some point in the future, and also enrich introspection by specifying the register naming conventions (uavcan.subj. *, uavcan.type.*). The electronic datasheets are likely to be preferred in high-reliability settings where any extra logic that is not directly related to the end application implemented on the node is undesirable; the way of introspection is likely to be more useful for highly sophisticated setups involving many complex COTS nodes from different vendors (robotics, autonomous driving, etc.). This is is unlikely to appear in the spec before UAVCAN v1.1, but nobody is stopping us from implementing this logic in Yukon as a vendor-specific extension which is to be specified later. Oh geez @pavel.kirienko, I’m getting flashbacks to directshow. Contribute to yunity/uavcan-web development by creating an account on GitHub. Oh wow. May I ask you to share a few words about that undertaking? I see that it is based on UAVCAN v0, which makes sense considering that I am yet to publish my rewrite of pyuavcan which is UAVCAN v1.0-compatible. Do you have migration to UAVCAN v1.0 on your short-term roadmap? I have much more experience on frontend/backend/web stuff than C++ / I’m able to help much much more with this one! uavcan-web is extra nice; Having such a separation layer is a must for a portable UI. Edit: Api endpoint versioning could go in par with potential breaking changes in the spec. 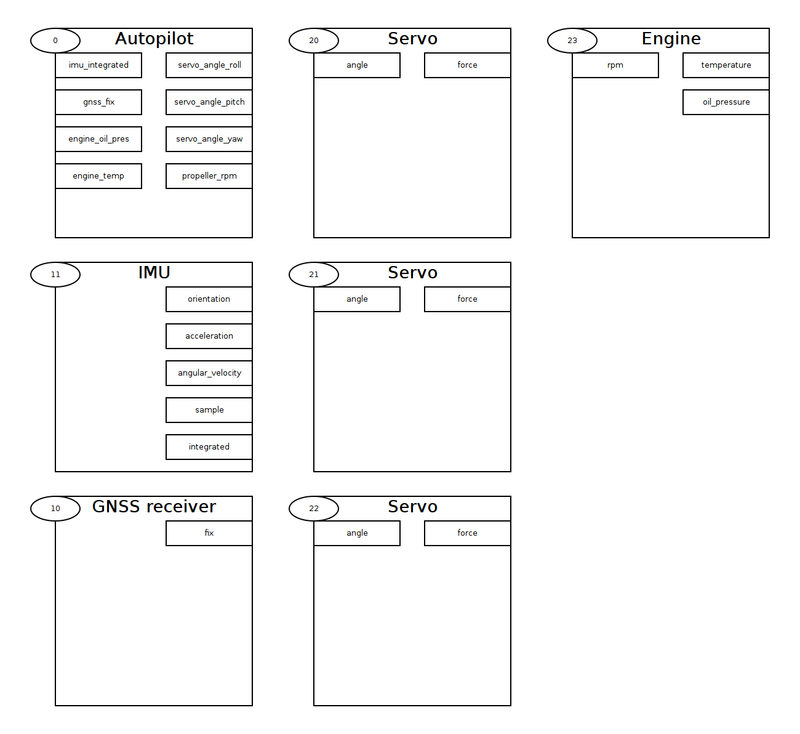 Perhaps we can provide minumum-boilerplate starting project templates so anyone can use this. This is great to hear! Us bit twiddlers have been looking for help from UI wranglers for awhile now. @Linjieqiang would you be willing to work with @Zarkopafilis to start Yukon as a Vue/Flask project? I’d like to avoid React because Facebook and messed with the licensing in the past (I’m not sure if they changed it back to plain-vanilla MIT or if they still have the “we haz all your patenz” clause in it but I’d like to avoid it). I’m cool with that. We can start by working out some endpoints and data contracts, then UI and backend can go sort of in parallel if we split the work up. I’m away at Germany due to a family trip. I’ll be back at 21/Feb and after finishing the TxQueue PR (a very small fix and it should be ready), we can start iterating the agile way, without having a strict wireframe spec. I guess we can start with some mockups too? This is great to hear! I have one PR pending in Yukon (Paging @pavel.kirienko -> https://github.com/UAVCAN/Yukon/pull/1) that lays out some very initial guidelines. Mostly I want to build a very modern GUI that avoids windows, dialogs, drop-down menus, and other dated interactions that nobody really likes. We should take our design cues from the web and IDEs that aren’t Eclipse (e.g. vscode and Atom both have a lot of nice interactions we could emulate). I really don’t have time to contribute much to this effort other than help review and consult since my time for open-source work is dedicated to libuavcan these days but I’ll do what I can to get this started. It’s really very important to the ongoing success of uavcan. We should also write down the final technology decisions in the Yukon readme. 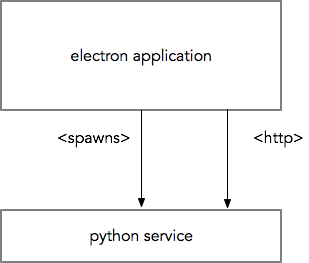 We did not consider an Electron based front-end if you have experience with that at all? Barring that I think Flask/Vu.js might be a good start for the front-end. What’s most important is to get a good interface layer between the core python toolset and any GUI we want to put on top of it. Sorry, I hadn’t realized that it’s been waiting for my review. I normally ignore push notifications (maybe that’s because I push a lot), so in the future don’t hesitate to nudge me relentlessly if you need me to look at something. Sorry. Mostly I want to build a very modern GUI that avoids windows, dialogs, drop-down menus, and other dated interactions that nobody really likes. Crap. I love all that stuff. Can we at least keep a tiny command line hidden in there somewhere? I should probably inform the public here that my pyuavcan rewrite is fully asynchronous and requires Python 3.6+ at the moment. +1 for the command line. It needs to be decided whether it would be based on the interface layer (REST or whatever), or on newest pyuavcan. We should have two “command-lines” actually. First: anything that you can do through the GUI you should be able to do through a command-line-only python script (i.e. we shall have feature parity between the GUI and either pyuavcan or an automation layer on top of pyuavcan). Second: we should have a “one-box” widget like vscode has via CMD+P that allows navigation using the keyboard. Which re-raises the question: should this be an Electron application or even a VSCode extension? Which re-raised the question: should the be an Electron application or even a VSCode extension? My humble opinion is that things like Electron and VSCode come and go, whereas standalone web apps seem more dependable in the long term. Fair enough but I think the two are a bit different. 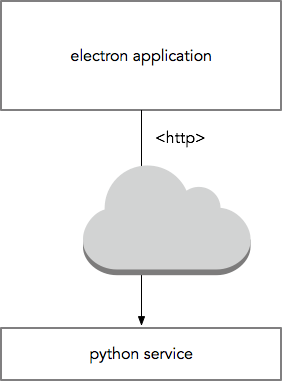 Electron is an application framework that is simply more full-featured and higher-level then our proposed flask/vu.js framework. VSCode is something that can fall out of favor which would affect us. @scottdixon I also think Electron maybe is a better choose for us. Front-end - We can have one person concentrate on just the nodejs front-end without needing to touch python. automation/service layer - We can have a person that concentrates on the python service API and command-line automation components. pyuavcan - the automation./service layer is built on pyuavcan so this is another interface layer we can separate concerns at. [automation project] - RESTful-HTTP and commandline automation on top of pyuavcan.